January 1, 2013, marked yet another anniversary of “Nu, Pogodi!” (“Just You Wait!”): the cartoon series has been hailed by viewers as a Soviet animation masterpiece for over 40 years now. The series is proudly positioned amongst the top five Soviet and Russian films, as rated by IMDb (Internet Movie Database) users. Meanwhile, as it turns out, Soviet officials were poised to shut the project down after a few successful episodes. Ever since the Soviet era, Russians have been fond of this animated series about the mischievous Wolf chasing the Hare. The latter can actually be considered the epitome of an ideal Soviet person: as an athlete with advanced engineering skills, he takes part in amateur performances, lives a healthy lifestyle and abides by the rules. The cartoon series has scored 8.9 points out of 10 on the Internet Movie Database website (IMDb.com), with users, in their reviews, lauding the humorous sketches, the appropriate background music, and the charm of its main characters, as well as the accurate reflection of Soviet reality. For instance, mail-3839(U.S.) wrote: "Besides the adventures in the chase for the rabbit you see nostalgic elements of Russian urban, and suburb life. Where else can you find a children's cartoon where the bad wolf smokes cigarettes, drinks beer while eating dried salted fish, steals and vandalizes property? One can't help but fall in love with both the hero and villain." "Another factor which differentiates Nu, Pogodi! from other cartoons, is that the background music isn't orchestrated for the cartoon series, but rather popular Russian/contemporary songs are incorporated," Tony Straka (U.S.) said. "You will hear popular music from the time that particular cartoon was made. Wolf will be chasing Hare in an episode from the late 1970s, while a disco tune is playing; another episode from 1984 contains techno/pop music from that particular time period. The visual effects are set to the music, which allows for some comical moments!" 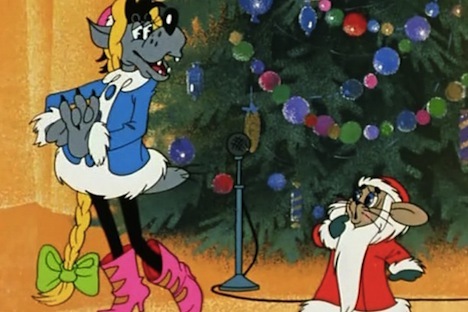 The pilot episode of the series – a sketch about the Wolf and the Hare directed by Gennady Sokolsky and later used as a prototype for the series – was featured in the first number of the first cartoon journal, “Vesyolaya Karusel” (“Happy Merry-Go-Round”). In the sketch, as the Wolf fails to hit the mark shaped as the Hare at a shooting range, the slogan (the famous “Nu, pogodi!”)that later became the name of the series appears for the first time. The series was produced by the Soyuzmultfilm studio from 1969 to 1993, with 18 main episodes created, followed by a sequel in the early 2000s. The main episodes were directed by Vyacheslav Kotyonochkin, and his son Alexey taking over the reins for the sequel. “Nu, Pogodi!”very truly captures the reality and artifacts of its time. The entire environment that is now perceived as the retro charm of the cartoon was actually true for the Soviet people of the 1970s and 1980s: commodity shortages, cars, telephone booths, soda vending machines, and holiday destinations. Even the soundtrack for some of the episodes featured certain popular hits of the time: for instance, the “Song About a Friend” by Vladimir Vysotsky, or songs by pop icon Alla Pugacheva. Likewise, the songs written for the Hare and the Wolf are still popular and often quoted. Even some of the events in the storyline are true: for instance, the scene of one of the episodes is set in Moscow during the 1980 Summer Olympics. The production of the series has sparked numerous stories and anecdotes. It is believed that the government did not like the image of one of the main characters, the Wolf; singer, songwriter, actor and poet Vladimir Vysotsky cast as the voice for the Wolf was not approved by the government either. It is also known that the project was nearly shut down after the first few episodes, after Felix Kamov (one of the scriptwriters) decided to emigrate to Israel. It was rescued by actor Anatoly Papanov, who was eventually cast as the voice for the Wolf and who had immense popularity at the time: he complained to a Communist Party chief that his family would miss the cartoon heroes, and the production was resumed without too many changes. Meanwhile, the end of the Soviet era did not mean the end of troubles with government approvals for the series. After the law On Protection of Children from Information Harmful to Their Health and Developmenttook effect in September 2012, some mass media reports suggested “Nu, Pogodi!” would be assigned an 18+ rating and aired only after 11 p.m.
“Nu, Pogodi!”is now often compared to “Tom and Jerry.” According to his son, however, the first time Vyacheslav Kotyonochkin saw the American series was in 1987, when 16 episodes of its Soviet rival had already been produced.